This masterpiece from the business author Patrick Lencioni is one of six books that inspired EOS. Anyone familiar with Patrick Lencioni’s work will know how popular his ideas are among business leaders. The Four Obsessions of an Extraordinary Executive is aimed at leaders with a studious nature and open to learning about business culture. Patrick Lencioni’s “The Five Dysfunctions of a Team” was one of the six books that inspired the Entrepreneurial Operating System (EOS). First published in 2002, it takes the form of a modern parable: a story traditionally used to illustrate an important moral or spiritual lesson. However, in this case, Lencioni has used the parable to illustrate what he considers to be a crucial lesson about team leadership in the business world. The other day, I was talking with a tech entrepreneur and asked him “What are the biggest challenges you face in your business? Most dedicated business owners can relate to this. Letting go of the reins and handing them over your employees can be a real struggle, and if you want to grow your business, you’ve got to do it. Business owners must carefully define the roles and responsibilities of the company, hand these jobs to the right person and have the confidence not to jump in or micromanage every task. If you struggle with “bottleneck syndrome”, we recommend Ken Blanchard’s The One Minute Manager Meets the Monkey. Podcasts are a great way to educate yourself on the go – whether you’re on a plane, a train or on in your car, you can make unproductive time productive. They provide great value, and the best are beautifully produced, and are using entertainment to embed the learning. With so many podcasts for entrepreneurs – and the number is growing daily – it is sometimes like being a child on Christmas Day, trying to decide which present to open first. My current favourite is “Masters of Scale with Reid Hoffman“. If you’re a typical entrepreneur, you probably have 100s of apps you thought you needed but have never opened since. Yes, I’m going to recommend another one. But this one is worth the space on your phone. 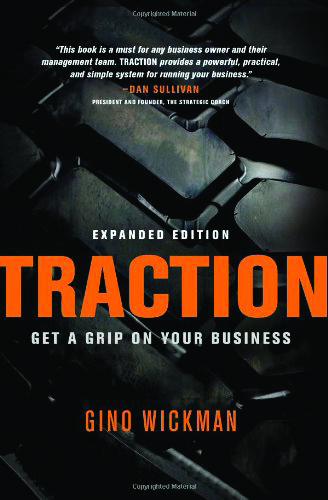 In many ways, “Get a Grip” is a key follow-up to Gino Wickman’s previous book about the Entrepreneurial Operating System (EOS), “Traction.” In this review of Get a Grip, we’ve seen how the book takes the same ideas and concepts from Traction and puts them into context through the fable of “Swan Services,” a fictional company which is putting EOS into practice. Book review: What the heck is EOS? What the heck is EOS? is the latest book about the Entrepreneurial Operating System, written by founder Gino Wickman and Certified EOS Implementer Tom Bouwer. It’s a really clear explanation of the process and is the perfect book to help you get to grips with what might at the start seem like a tricky system to understand. The authors have joined forces to create a book that will become many readers’ best friend. It breaks down EOS in a way that offers an enjoyable and straightforward read from beginning to end, and can provide a quick refresher when needed. ‘Rocket Fuel: The One Essential Combination That Will Get You More of What You Want from Your Business’ focuses who should be at the top, leading your business. In it, the authors describe the explosive combination that is the key to getting everything you want from your business. Are you a goal-setter? Do you set New Year goals? I’m a goal setter, and always review my last year’s goals and set targets for the new year. R – realistic: is it achievable? I’ve found the following apps help me to stick to my resolutions and achieve my goals. This is brilliant. No more scrappy notes, no more forgetting to do things, now I have it all in Any.DO. It gives daily planning and to-do lists, which syncs with the cloud so it works on all your devices and integrates with emails, calendar and Google tasks. It gives you alerts when you are due to do something, will schedule meetings for you and make calls, text and email. You can share lists with friends and colleagues, it even has speech recognition and to clear tasks you just need to shake it. 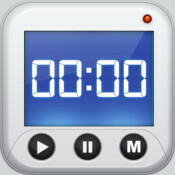 This is a handy little timer app. It lets you set multiple timers at once – by the second, minute and hour. It’s got seven different alarms and you can save, label and reuse different times. I love baking, so I use it when I’m cooking, and I’ve also saved the timer for my yoga stretches so I don’t have to reset it every time. This is the ultimate travel app, great if you live in London or New York. It’s made me healthier, greener – and richer – since I started to use it because I walk so much more. It shows you how to get from A to B by any route, gives real-time information about anything and everything transport-connected – the progress of your nearest bus, where the nearest cycle docks are and how many bikes are left there, tube delays, the weather, the disruptions and more. It even tells you how much the different routes will cost, how long it takes to walk to every tube line, and how many calories you will burn if you walk or cycle. This is the best travel search site that I’ve found and I use it all the time for cheap fares, care hire and hotel bookings. As well as bookings, you can also use it to track your flights, look up baggage fees and find out the phone numbers of all the airlines. I’ve got the Pro version which even has maps of the terminals at 100 airports.